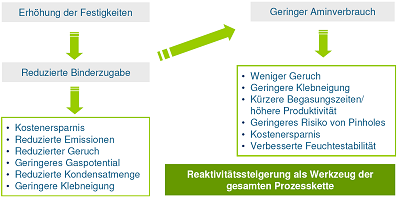 Process for the production of cores in which, in principle, cold, i.e. not heated or hot, core boxes are used. The popularity of this process (it has now been in existence for over 40 years) and, above all, the possibility of creating core shapes with high productivity lead to it having a market share of more than 60% (Fig. 1, ASK Chemicals). Fig. 2 (ASK Chemicals) are the focus. The molding material is prepared in rotary blade mixers or in continuous mixers which work continuously (see also Core sand mixer). Standard molding materials (quartz sand, zirconium sand or chromite sand) can all be solidified as long as there are no alkaline components, in particular basic metallic oxides, in the sand. The sand temperatures should not exceed 30°C; the limit of the processing time is two hours. After the core is shot (see also Core shooting machine), it is hardened in the core box using a concentrated amine fog (Hüttenes-Albertus Chemische Werke GmbH). The gassing and disposal equipment are highly significant in terms of the technology used in the cold box process. The requirements of the lowest catalyst consumption and the shortest gassing times are crucial for the economic efficiency and ecology. The gassing machinesmust ensure that the catalysts, which are usually liquid at room temperature, are mixed well with a carrier medium and brought into all areas of the core in order to ensure quick and uniform hardening. If air is used as a carrier medium, it must be largely dry. The binder consists of an organic two-component system, specifically a phenol resin (component I) and a polyisocyanate (component II). This system hardens rapidly at room temperature in the presence of a catalyst so that the core possesses enough durability for the handling which follows. Fig. 3 (ASK Chemicals) shows a typical composition of a cold box binder system. Component I is an approx. 55% solution of a phenol-formaldehyde resin. On the one hand, the solvent is necessary in order to thin the highly viscose resin down to a viscosity which can be processed; on the other hand, important properties such as reactivity, moisture resistance and sand lifetime can be influenced via the solvent. Component II consists mainly of diphenylmethane diisocyanate, or MDI for short (approx. 80%). Solvents are also used here for thinning and in order to set specific system properties. Common solvents include aromatic (naphtha) and aliphatic compounds, polar carboxylic acid esters, plasticizers, fatty acid esters and organic silicates. In the recent past, attempts have been made, above all, to influence emissions such as the smell or BTX substances which are released using the solvent combination. Solvents were the main focus and were banned from many cold box forms as potential BTX emitters. However, with regard to this, it must be considered the overwhelming majority of BTX emitters are formed out of phenol-formaldehyde resin and isocyanate which make up almost 70% of a cold box formula. 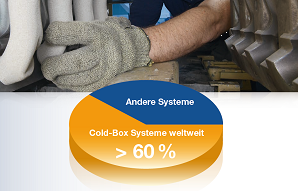 The creation of BTX substances is therefore unavoidable due to the basic chemical structure of a cold box system, regardless of the solvent components. Furthermore, the relationship between the origin and the creation of BTX substances is disputed. High temperatures and a reduction effect, such as in iron casting, can lead to even apparently harmless organic substances recombining into benzene derivatives via intermediates. An effective measure for the sustainable benefit of the ecology and economic efficiency is the increasing of the efficiency of a binder system through an increase in reactivity in conjunction with a decrease in the overall binder amount. Through new types of process in resin synthesis and specially adapted solvent combinations, it is possible to design some binders which have an efficiency which is considerably higher than that of standard systems. The mechanical properties of the sand cores which are produced with these systems are comparable to those of standard products, despite the reduction in binder (of up to 25%) (Fig. 4, ASK Chemicals). Ultimately, the increase in reactivity leads to a considerable increace in immediate strength. It is exactly these initial strengths which are often the limiting factor in the production of cores. After the cores are produced they must have sufficient basic strength and be fully hardened in all parts of the core in order to be able to go through further processing steps such as handling by robots, jointing or facing coating reliably. However, it is also incredibly important that the reduction in binder also leads to a considerably potential to save amine. This is not only reflected positively in the smell, it also, in addition to the saving in material costs which is just as important, enables an optimization of the core production process (see Core shooting machine), such as through a reduction in gassing times or a reduction in the tendency to stick. Larger amounts of amine which remain in the core reduce the moisture resistance. Fig. 5(ASK Chemicals) provides a clear illustration of the advantages of a reduction in binder. 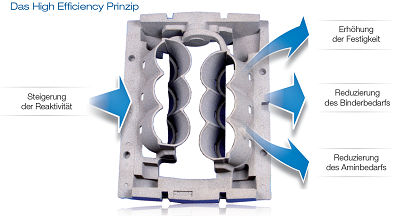 The increase in reactivity can therefore be regarded as a highly efficient tool for the optimization of the entire process chain. Fig. 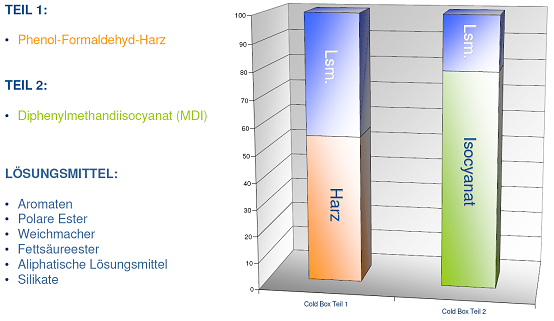 6 (ASK Chemicals) shows the difference in amine consumption for a standard cold box system in comparison with a highly reactive system. The illustration shows the hardened amount of coresand in grams which can be obtained for gassing with 0.1ml of catalyst with a flushing pressure of 2bar.